+ MySQL as an Open Source RDBMS,is growing day by day and continue to mature. Yahoo! uses the MySQL database to power many of its web properties. The first was Yahoo! Finance (http://finance.yahoo.com), a popular web site that provides the full spectrum of financial services and information. MySQL is behind Yahoo! The Yahoo! technical environment includes the FreeBSD and Linux operating systems synchronized using MySQL replication. Many companies use MySQL to escape from terrible costs of Oracle licensing and save thousand dollars! MySQL Administrator :a program for performing administrative operations, such as configuring, monitoring and starting and stopping a MySQL server, managing users and connections, performing backups, and a number of other administrative tasks. MySQL Query Browser: a graphical tool provided by MySQL AB for creating, executing, and optimizing queries in a graphical environment. MySQL Migration Toolkit :a graphical tool provided by MySQL AB for migrating schema and data from various relational database systems to MySQL. 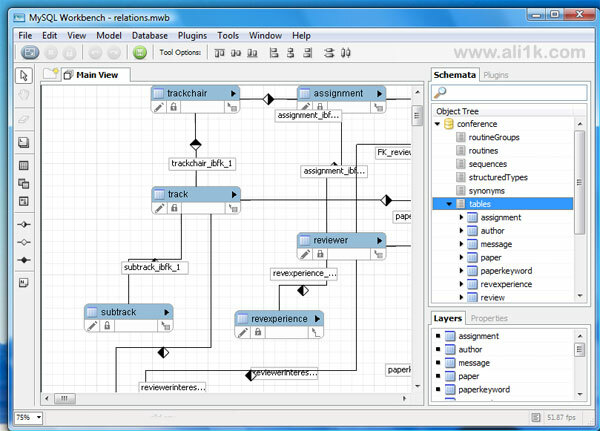 MySQL Workbench : a schema design application that enables users to graphically design and modify tables and other database objects, then automatically implement their design in MySQL. salam,man ham daneshjoie computere ce-sbu hastam vorodieh 84,az weblogeton va tarze neveshtaneton khosham miad,kollan estefadeh mikonam va khoshhalam az inke shoma ham dar daneshkade hastid ! Very true. GigaOM says in its report that mysql is even planning to go for a IPO somewhere in this year. That will be a remarkable milestone. Even OpenIndx project is powered by WAMP. Please check my blog for further reference. salam, khasteh nabashid az ashnayitoon khoshbakhtam man daneshjoee term akhar hastam vaseh projeh payani memari & piyadeh sazi language lab ro entekhab kardam. ostad tadrisesh java boodeh vali man natonestam chizi p[ida konam be sorat etefaghi vaghti dashtam search mikardam ba website shoma ashena shodam ,mitoonid komakam konid ? Salam.Nagoftid kojaye ER moshkel darid? man motevajjeh nashodam daghighan ER’e chiyo mikhayn rasm konid?! came to conclusion that WAMP Server IS the best out there. Easy to install, Intuitive to work with. Great software for all PHP developers out there. Make sure to start WHAP before Skype (and not the other way around). That the only “bug” I have found. Strongly recommend to use it!